Pet Wants Minneapolis Blog: What Are Dog Hot Spots? Living organisms have natural bacteria. Although this bacteria plays an important role in different aspects of health, things can quickly go wrong if something knocks the bacteria out of its natural balance. In the case of hot spots, the infection or inflammation stems from a dog’s natural bacteria overpopulating areas of skin. Of the various root causes of this overpopulation, underperforming immune systems are one of the most common. Allergies are another possible cause of hot spots. That’s true for both food and environmental elements. A hot spot can also arise if a dog has a spot on its skin that hurts and tries to calm it by chewing or digging. And even though they’re not as common of a cause, persistent chewing or licking triggered by boredom, separation anxiety or OCD can leave a dog with a hot spot. Finally, dogs with moist skin or thick coats are the most susceptible to hot spots. Although hot spots are a condition that should be taken seriously, it’s important to know that they can appear out of the blue. So if you suddenly notice a hot spot on your dog, you don’t need to panic. Instead, knowing how to help your dog deal with this condition will allow you to minimize any discomfort your dog feels and help support the healing process. 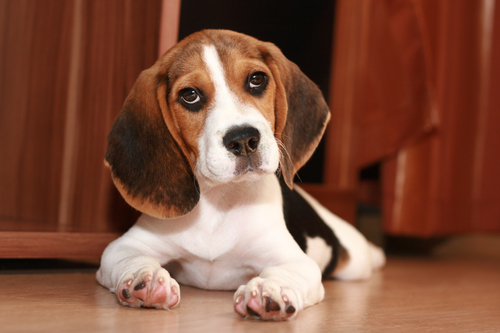 Since hot spots are a type of wound on a dog’s skin, you need to treat them accordingly. This begins with removing hair in and around the affected area. This is necessary to prevent the wound from spreading and getting worse. If you aren’t comfortable removing your dog’s hair from this area, you’ll want to enlist professional help. The next step is to disinfect the wound. Don’t hesitate to ask your vet for a recommendation on the best type of disinfectant to use. Once you clean the wound, you’ll want to gently dry it. The other important component of helping your dog heal is managing any discomfort so that your dog stays away from the wound. Our anti-itch skin spray is a safe and effective way to provide relief. In some cases, using an E collar may also be necessary to keep your dog away from the hot spot. Since there are a number of different issues that can cause hot spots, some dogs only experience this problem once, while others develop hot spots on an ongoing basis. If your dog falls into the latter category, you will want to bring the problem to your vet’s attention so you can work together to identify exactly what’s causing the hot spots and any steps that can be taken to prevent them. Natures recipe dog food provides complete and balanced nutrition to keep your active adult dog happy and healthy. It contains higher levels of protein to promote muscle health, as well as added vitamins to support energy metabolism and complex carbohydrates for sustained energy release. By-products, in many cases, are derived from 4D meat sources - animals that have been rejected for human consumption because they were presented to the meat packing plant as Dead, Dying, Diseased or Disabled.